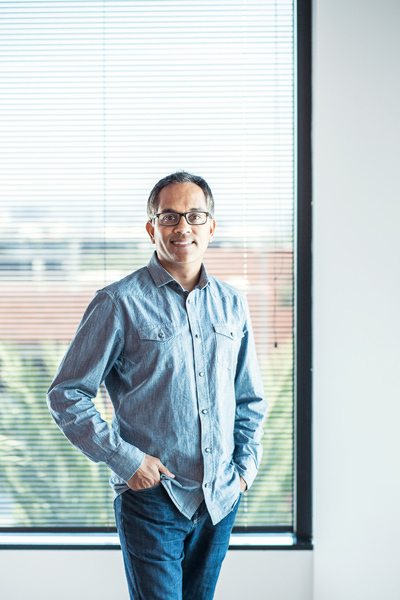 In a family of engineers and doctors, Amazon Studios’ associate general counsel Ajay Patel is one of the first lawyers. Growing up in California with parents who emigrated from India, he found he didn’t have the stomach for a career in healthcare—“I’ll be honest, the sight of blood made me not want to go into medicine,” he says with a laugh—but he had a knack for hashing out the typical arguments of American children. “I often debated with my folks, using logic so that I could convince them to let me do the things I wanted to do,” he says. So, from an early age, law was a more natural fit, but he also managed to develop the pervasive empathy and logical approach that made his family members successful in their own fields. Patel has since applied both of those skills to a lifetime of pro bono work. At the same time, he sought out opportunities to partner with Public Counsel, the nation’s largest pro bono law firm. Since 1970, the Los Angeles nonprofit has been rallying volunteer attorneys to the assistance of children, veterans, immigrants, and individuals and institutions in underserved communities. In 2008, Patel’s work with the organization earned him the State Bar of California’s Pro Bono Lawyer of the Year Award. His relationship with Public Counsel dates back more than ten years, and when he joined Amazon Studios in 2012, he got the opportunity to continue that connection with Amazon’s strong support. In the fall of 2016, the Amazon Studios legal team worked with Public Counsel to provide legal services in support of National Adoption Day, an annual effort to serve, support, and celebrate adopting families. The day is observed the Friday before Thanksgiving. In addition to helping the families, the work helped develop the natural camaraderie of the already close Amazon Studios legal team. Team members were able to work with others in their group, which helped build new relationships within the office. Pro bono projects take place on Amazon legal teams all over the world, and Patel envisions pro bono projects being undertaken by multiple offices in different cities in the near future as he and his company continue to invest in protecting workforce comity and culture. He looks forward to the Amazon continuing to give back in meaningful ways to the communities where its employees live and work. “At a fundamental level, we view our team as family, and this is a group that everyone feels very comfortable and happy to be at work with,” he says. The Association of Corporate Counsel’s Southern California chapter chose the members of Amazon Studios’ legal team as the Corporate Pro Bono Lawyers of the Year for the work they did on Adoption Day, which has further stoked their enthusiasm for and commitment to charity work. “The great thing about Amazon is that they are very supportive of our legal team pursuing opportunities like this,” Patel says. “Experiences like this make me proud to be part of the legal profession and proud to be working at Amazon. Among those encouraging others by emphatic example is Amazon’s senior vice president and general counsel, David Zapolsky. He developed Amazon’s pro bono program in 2014 and has been its vocal leader ever since. Amazon’s pro bono programs have grown in size, reach, and variety and provide meaningful, manageable volunteer opportunities to Amazonians in the legal field in immigration assistance, refugee situations, the arts, and more. The organization has been a good fit for Patel, who leads by example in making charitable efforts a priority in his family life, as well. Each holiday season, he and his family adopt another Los Angeles family to provide gifts to—often necessities such as towels and pots, to the wonderment of Patel’s two young children, who equate Christmas with toys, not household items. The practice gives Patel an opportunity to build connections in the community, bond with his family, and give his children a practical exercise in generosity and economics. In the four years his family has participated in the program, it has inspired a dozen other families from his neighborhood to do the same.